Lattice multiplication is a fun way of solving long multiplication problems with a grid. This page contains lattice grids of various sizes. 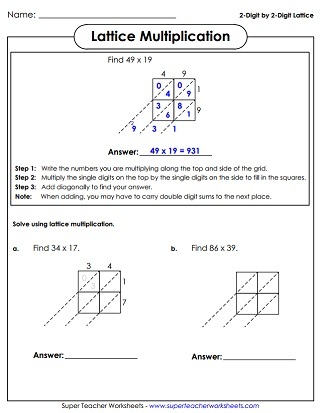 There are also several practice worksheets that explain how to use the lattice method to solve multiplication problems. 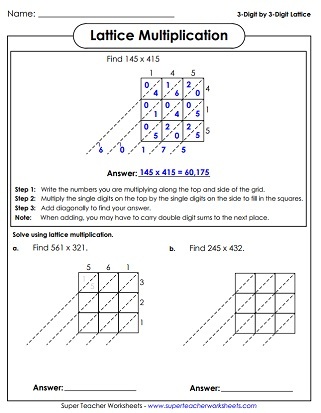 Worksheet gives an example and explains the steps to solving lattice multiplication problems. There are also several practice problems for students to try. 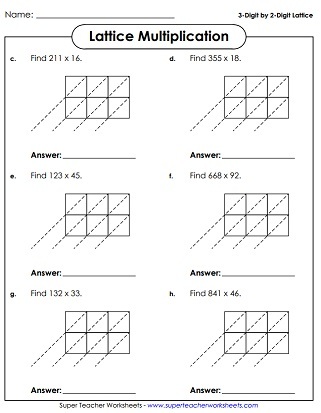 Print out a page of blank lattice multiplication grids to help your students solve problems quickly and accurately. Shows the steps to solving lattice multiplication problems and gives an example, followed by many practice problems for students to try on their own. A pages with lots of blank 3-by-2 grids to print out. Once your students have mastered simpler lattice multiplication grids, have them try these large 3-digit by 3-digit problems. 3-by-3 lattice grids to help your students solve challenging lattice problems.